If there’s one thing I always believed in, it is this. If you don’t know what’s coming out in any brand’s upcoming collection, chances are you won’t even bother to visit the boutiques. And because Chanel is still one of those few brands who don’t do any retail online, it is important to keep you all here updated as best I can. Take, for example, Chanel’s soon-to-be-released Fall-Winter 2018 collection. Yes, besides having seasonal hues that are much richer overall, there’s something about the colour combination above that some might say is very Christmassy. Why? Because with this collection selling all the way till November 2018, it does make sense to have the right colours to get all of you in the mood. So what can you expect from all Chanel’s #BoyChanel line-up this season? 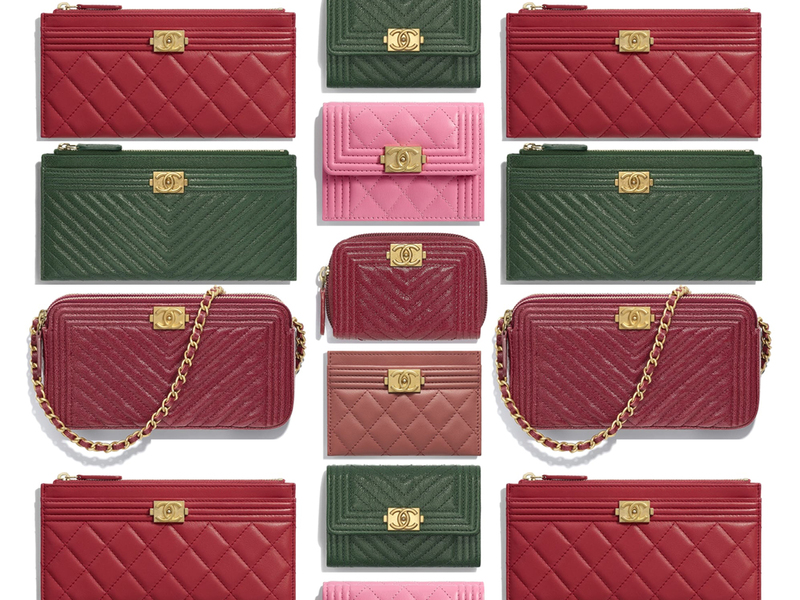 First, let’s focus on the longer ones (from top down), namely both Boy Chanel pouches (19 cm by 10.5 cm, SGD1210 each), one quilted, one with chevron quilting. The 3rd piece is the Boy Chanel Pouch With Chain, an even more functional piece that comes with a sling, 3 compartments and sells for SGD2600. Moving on there are the 4 SLGs (from top down), namely the Boy Chanel Card Holder (11 cm by 7.5 cm, SGD780), the Boy Chanel Small Wallet (10 cm by 9.3 cm, SGD1120), the Boy Chanel Coin Purse (11 cm by 7.5 cm, SGD800) and the Boy Chanel Card Holder (11 cm by 7.5 cm, SGD600). All fun, all functional, and all guaranteed to give you a good time. See what I mean now? Yes, too many boys, too little time.